I duplicated my copy so am sending this as a holiday RABCK.com treat. Reluctant teenage superspy Alex Rider is useful to the national security services in ways an adult could never be. Now they require his help once again: for a routine reconnaissance mission at the Wimbledon Tennis Championships. 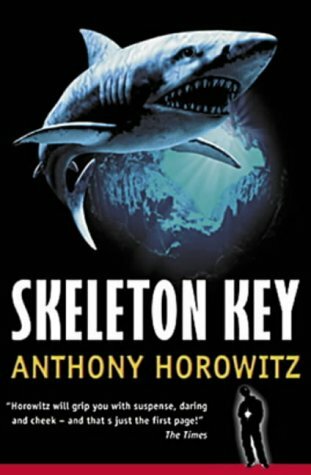 But before long, Alex finds himself caught up in a terrifying chain of events that leads from the Chinese Triad gangs in London to an undercover assignment on Cayo Esqueleto - Skeleton Key - Cuba. There, Alex begins to make chilling links between several suspicious deaths, an illegal nuclear weapons deal and the plans of his host, Russian General Sarov, for the future of the world. Alex faces his most dangerous challenge yet. Alone, equipped only with a handful of cleverly concealed devices, he must outwit the coldly insane Sarov...or die. Thanks very much GlitterLover for the surprise gift, I've decided it's a Christmas present as I'm still unwrapping after being abroad for the holidays! This book was good, I enjoyed it more than the previous two in the series. I also love the sparkly cover! Now I'm sending it on to wal-89 as a trade.